The thickness of materials cannot always be determined by direct measurement, as access to both sides is not always possible. 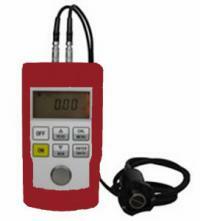 Ultrasonic Material Thickness Gauges allow you to test the thickness of a pipe from one side. The effects of corrosion and erosion at the back of a metal panel may reduce its thickness significantly, yet not affect the front surface. Pipelines for example, may have been eroded by the flow of material inside. Machined or cast items may have thin walls that cannot be determined by callipers or other non-destructive tests.The Elcometer range of ultrasonic material thickness gauges has been designed specifically to be easy to use, calibrate, take readings and create inspection reports. 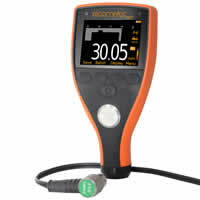 With a wide range of measurement modes including: Pulsed Echo (PE), Echo Echo ThruPaint™ (EE) and Velocity Mode (VM), and a wide range of intelligent dual element transducers, the new ultrasonic thickness gauges can measure the material thickness of virtually any material such as metals, plastics, glass, epoxies and ceramics. Ideal for measuring material thickness when only one side of the material is accessible, the ultrasonic thickness gauges can measure the material thickness and sound velocity of coated and uncoated surfaces. From a steel thickness gauge to a gauge which ignores the thickness of the coating, Elcometer has a complete range of ultrasonic thickness gauges to meet your specific requirements. The more sophisticated gauges also have the capacity to be able to store data and download readings to a computer with the free ElcoMaster®software. BAMR also offers a more competitively priced range that can be used for predominantly steel application. These units range from the entry level model that has a 1 decimal resolution to the more sophisticated model that has a 2 decimal resolution and can download readings to a computer.